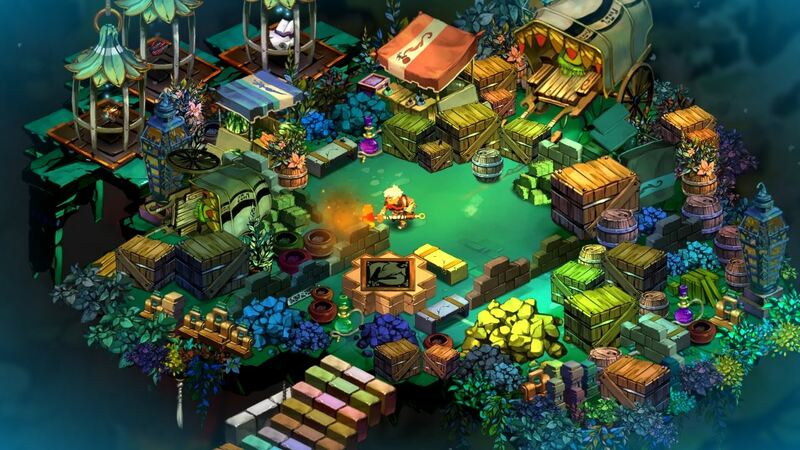 If you follow indie games at all, you've probably heard of Bastion. During its development, it took home numerous Best in Show prizes from E3 and other game conventions while building up an incredible amount of buzz in the games press. 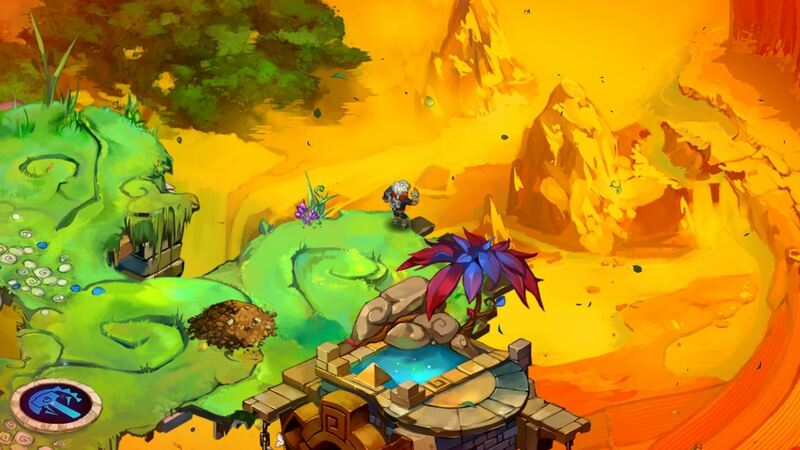 Part of what is intriguing about Bastion is its cool art design, which in the last couple months, peaked my interest more so than the gameplay or the much-ballyhooed narration. Bastion was released last Wednesday, marking the start of Microsoft's annual Summer of Arcade promotion and setting the bar extremely high for the four games set to follow it. Known only as "The Kid", Bastion's hero begins by sleeping on his bed in a room floating in space. He awakes, and upon leaving his room, the world begins to materialize out of the nether around him. Soon he begins to acquire weapons, confront enemies, and bit by bit—rebuild his ravaged, cataclysmic world. Launch trailer. Contains mild spoilers. The way the story unfolds is like nothing ever done in a game before, and was the most discussed feature of the game's pre-release. There are no cutscenes and barely any moments where the player loses control of The Kid for any sort of prearranged sequence. The characters never even exchange dialog. With a surprising breadth and depth, the main story and backstory is told via thousands of lines of narration that accompany almost everything one can do in the game. Rather than coming straight out and explaining the story, the narration alludes to it constantly. Slowly it creates and connects disparate pieces of the plot until they come together brilliantly at the end, with just enough ambiguity intact that the player is left wanting more. The narrator's voice is the soothing baritone of an old man, although the actor is quite young. His cleverly-written words, the only script the game has, manages to deliver a lot of information in a very unconventional way without sacrificing clarity or artifice. They also never become annoying or repetitive, two things many feared might happen. Excellent background music rounds out the audio experience. It flies in the face of the 8-bit music fad for games and uses mostly somber songs recorded with guitars and wind instruments. Two of the songs even have vocals, which rarely happens in video games, since vocals make its inherent repetition more jarring. Supergiant's composer handled it well, and the songs with vocals are the best of the whole bunch. No clarity or artifice were sacrificed in the making of the graphics either. Few games have as strong of a visual design as this. The world looks like nothing else and everything in it looks like it belongs there, even the most idiosyncratic elements. 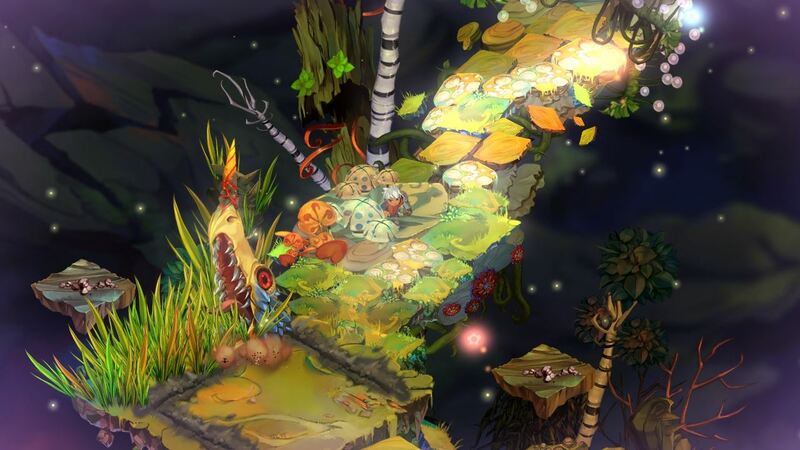 The viewpoint is isometric 2D overhead, with sprites and background covered all over in bright colors. The way the world appears from thin air around The Kid as he moves is entrancing, leading me to walk down all sorts of narrow and improbable walkways just to see if another Day-Glo tree or giant glowing ice shard would pop out nearby. The plethora of hidden powerups were a nice bonus, too. Of course, none of that would matter much if it wasn't wrapped around such a fun, hard-working game. 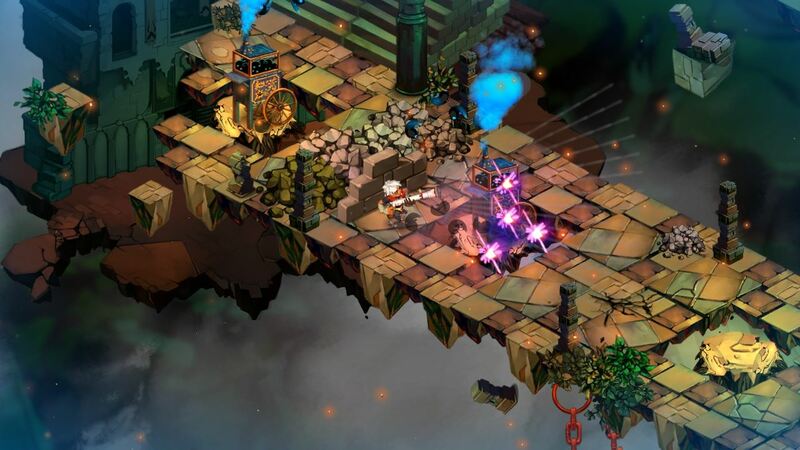 Bastion is predominantly an action RPG in the vein of Zelda or Diablo. The Kid wanders levels battling bad guys, gaining experience points and earning money, and using those to gain levels and buy better weapons while piecing together the story. These are supplemented by a wealth of cool ancillary systems, including (but not limited to) distilling restorative liquors to improve The Kid's stats, worshipping Gods that can be equipped to make enemies stronger but net The Kid yet more money and experience for playing levels, and even a little town-building. A scene from one of the weapon challenges. There are more colors in this picture than in the entire Gears of War series. More important than all of that, Bastion addresses the biggest problem those two great franchises share—limited combat systems. Diablo has a million weapons to choose from, but few meaningful differences between any of them as far as the actual mechanics of fighting. Zelda has more differentiated weapons that must be used in combination to succeed. But there is usually only one right attack for any situation, which makes sense since Zelda is in large part a puzzle game, but it can be constricting. Bastion has no such problems. Combat is fought mostly with four buttons. The Kid can equip two of the game's many weapons and one of its many special moves at once, each used with one of the buttons. Another button blocks. Despite this simplicity, there are dozens of different combinations of weapons (thousands if you count the creative and well-paced weapon upgrades) that each yield quite different and enjoyable experiences. Fighting bad guys this way is great fun. Finishing a level with one pair of weapons usually leaves The Kid wondering blissfully how he could have dispatched that last army of unholy scumbags more efficiently with a different bunch of guns. A debut game from a small indie developer with as much hype as Bastion had was almost begging to be disappointing. But that is not so—in any way. There are problems with it. I managed to cause a glitch near the end of the last level that trapped me on platform where a boss battle had been. There were no means of escape and no enemies to kill me. So I did what any reasonable gamer would do and threw myself off the edge of the platform repeatedly (you always land back on land when you fall off platforms, but slightly injured) until I died and could restart from the last checkpoint. That's a pretty deep nitpick though. Other than that the game ran great. At $15, it might be the best cheap indie game of the year. Go play it now. The weapon challenge levels can require many tries because some are difficult. To ease the repetition there are reset switches near the exit to each challenge that allow you to quickly retry them. They can be tricky to spot. Whether this seems obvious to you after you play it or not, at least one very respected video game journalist wishes he knew it earlier. The Memorial is a lot more useful than it sounds. The Shrine is not, especially on your first playthrough. Don't forget to smoke the pipe and eat the stew! Just because a weapon isn't very fun to use at first, don't give up on upgrading it. Some of them start out useless but become great with upgrades, so keep experimenting. A lot of of the magic of this game is the way in which all of the different weapons play off each other. Plus, the narrator has a quip about the killing potential of each combo that gets The Kid fired up for some slaying every time. The first 15 minutes of the game, in case you aren't convinced. News: Introducing Indie Games Ichiban: "Better Games for Less Money"